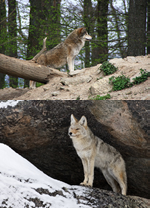 Ontario, April 5, 2016 - The David Suzuki Foundation and Ontario Nature welcomed Ontario’s decision today to maintain current hunting regulations for Ontario’s northern wolves and coyotes. In December, 2015, the Ministry of Natural Resources and Forestry proposed to address declining moose populations by making it easier to kill wolves, removing any limit to the number of coyotes that could be killed by licensed hunters, and opening up the hunt to non-residents. The David Suzuki Foundation, Ontario Nature and other organizations argued that science does not support predator control as a long-term, successful means of managing moose and other prey populations. There are many potential factors contributing to moose decline in Ontario in recent years. The one certain factor is hunting pressure by humans. Appropriately, the Province has been implementing changes to the hunting regime, and is seeking to better understand the causes of moose decline. Ontario Nature protects wild species and wild spaces through conservation, education and public engagement. Ontario Nature is a charitable organization representing more than 30,000 members and supporters, and 150 member groups across Ontario. For more information, visitontarionature.org. The David Suzuki Foundation is a Canadian non-profit environmental organization dedicated to finding solutions through science-based research, public engagement and policy work. To find out more about the David Suzuki Foundation, visit www.davidsuzuki.org or follow us on Facebook and Twitter.